The Medal of Honor is our nation’s highest military award. Presented by the President of the United States in the name of the U.S. Congress to members of the U.S. Armed Services, it has been bestowed upon 3,469 heroes to date. The Medal is awarded for “conspicuous gallantry and intrepidity at the risk of life, above and beyond the call of duty, in action, involving actual conflict with an opposing armed force.” Suspended by a ribbon, it is the only medal to be worn around the neck, and it is displayed above all other decorations. 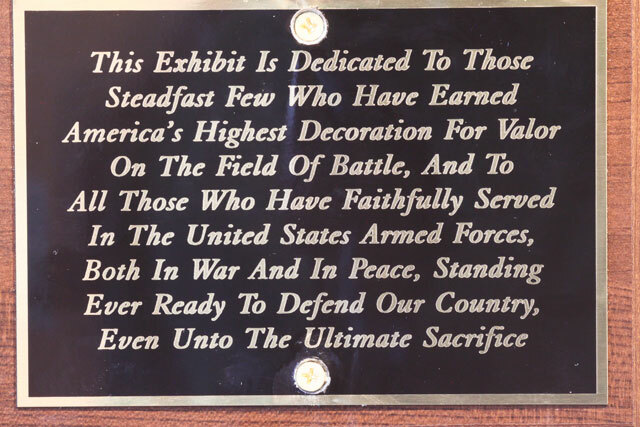 Read any one of the panels in this exhibit, and you’ll instantly know that the level of heroism honored by the medal defies human imagination. Those awarded the Medal of Honor are known as “recipients,” not as winners. 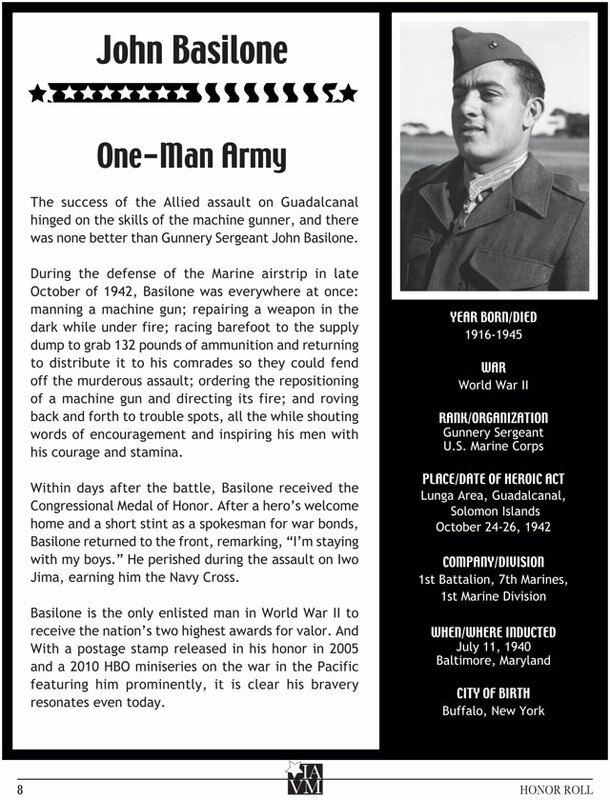 Often, the hero perishes while earning the medal, making “recipient” a more appropriate term. The decoration is frequently referred to as the “Congressional Medal of Honor,” but the proper name is Medal of Honor. 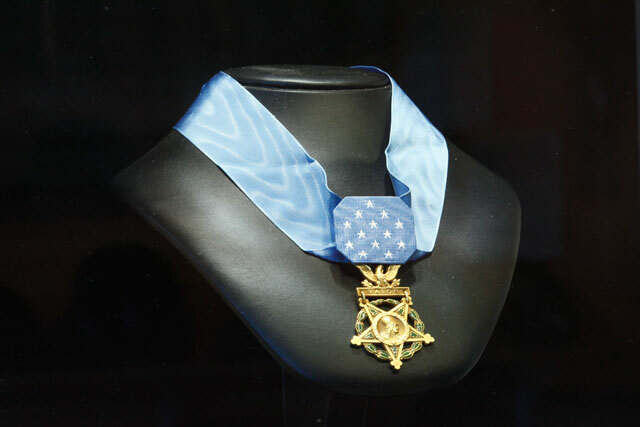 Although originally created specifically for the American Civil War, Congress made the Medal of Honor a permanent decoration in 1863. Navy (instituted in 1861) — Initially the Navy Medal of Valor, it was to be bestowed upon “such petty officers, seamen, landsmen, and Marines as shall most distinguish themselves by their gallantry and other seamanlike qualities during the present war.” Marine Corps and Coast Guard personnel receive the Navy version of the medal. Air Force (instituted in 1965) —Prior to the introduction of the Air Force version, members of the U.S. Army Air Corps, U.S. Army Air Forces, and U.S. Air Force received the Army medal. 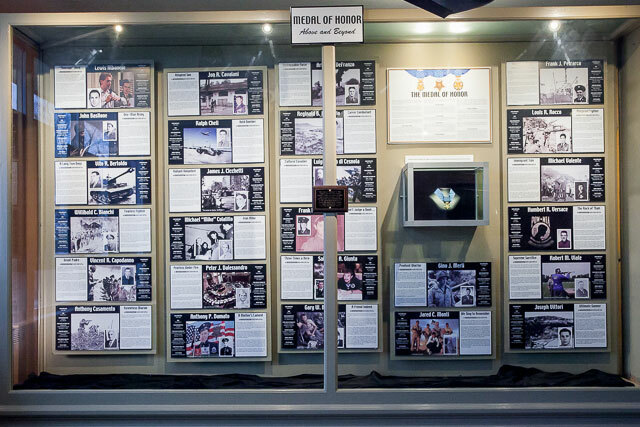 The Medal of Honor on display in this exhibit was bestowed upon the Italian American Veterans Museum by the United States Army. The Italian American Veterans Museum would like to thank the following individuals for their service above and beyond the call of duty in the creation of our Medal of Honor exhibit: Dominic Verlotta and Bill Bianchi of Speed-O-Lite Printing, Dominic Sergi of Rex Electric and Technologies, Mary Racila of Fra Noi, Laura S. Jowdy of the Congressional Medal of Honor Society, and Felicia Reilly, who researched and wrote the entire exhibit. Our thanks also go out to Samantha Andreacchi, Michael Bahr, Louis Carlozo, Rachel Clinkman and Kelly Raines.